By desexing companion animals, they become less aggressive and easier to control. 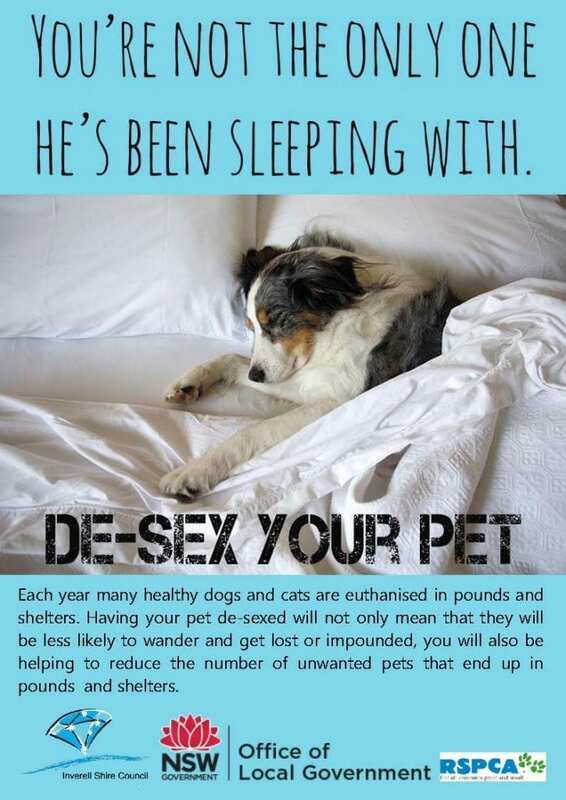 Inverell Shire Council recommends that pets are desexed if they are not intended to be used for breeding. By desexing your pet, you are helping to reduce the problem of unwanted puppies and kittens, as well as promoting positive health and behavioral changes. Be less inclined to develop aggressive habits. In reducing the population of stray and unwanted cats, you will be protecting our native flora and fauna which is threatened by stray cat activity. What is involved in desexing? You are able to desex your pet at any age, even as young as eight (8) weeks. It is recommended, however, that you desex your pet before it reaches three (3) months of age. While you are at the vet, it is also a good idea to get your pet microchipped. Desexing is undertaken by a veterinarian, and the procedure is straightforward. Most pets recover from surgery within 24 hours. If you have any questions or concerns about what is involved, and the recovery process for your pet, talk to your local veterinarian.